The Bulgarian artist Elena Zhelebova, who stirred a scandal for her work depicting Bulgaria as a toilet at an exhibit in Brussels, has turned out to be a completely mysterious person, the Darik radio reported Tuesday. A team of Darik reporters has found out that most galleries where the artist is said to have had exhibits have never heard her name. She is also unknown to some of the most renowned Bulgarian modern artists, despite the fact that she is supposed to be one of them. The Union of Bulgarian Artists further declared that they were not aware of such artist and she was not included in their lists or archives. There are speculations that the person in question is a young author, residing abroad, or someone using the name Elena Zhelebova as an alias. A checkup conducted by the Darik reporters revealed that there wasn't any information about some of the other artists who have presented works at the Brussels exhibit. The exhibit in question is the initiative of the Czech republic, the country that is currently holding the European Union (EU) Presidency. 27 artists from the 27 EU countries have presented their view of their respective country. According to the exhibit's organizers, the works must display stereotypes about the 27 countries. As example, Spain is depicted entirely covered with concrete, the Netherlands are submerged in water while Italy looks like a giant football stadium. 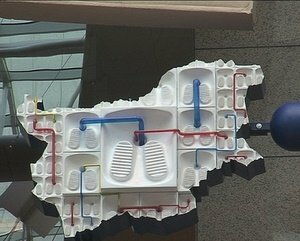 Zhelebova's piece, representing Bulgaria as a toilet, has stirred controversial reactions in Bulgaria. The country's permanent Representation at the the European Institutions has already issued an official objection to the work being displayed at the European Council building in Brussels. The Bulgarian Culture Ministry declared that they had nothing to do with the display and have not selected Zhelebova to participate in it.